School Lane took it's name from the droppings that hang from a sheep's underside (yeuch!!) and has since been renamed School Lane. 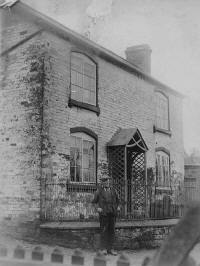 In 1901, the local school was located on Dag Lane, which is why the road was renamed. The start of the road, as it runs along the side of the Spread Eagle car park, lies on the route of the Via Devana Roman road that ran through the village in Roman times. 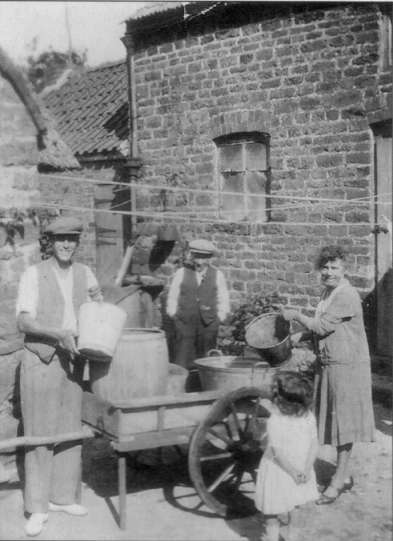 The top picture opposite shows members of the Jolley family doing the Monday wash in Dag Lane with buckets of water from the nearby well. The bottom picture shows May David's father in front of The White House, School Lane, which has always been regarded as one of the prestigious houses in Cottingham, having warranted a mention in the gentry list in the 1903 Kelly's Directory, then owned by a Miss GE Pery. In the 1870s, a Mrs Pery was listed as the owner of Bury House.